Political Gum Hockey’s stable of expert pundits has learned that former Arkansas Governor and current Fox commentator Mike Huckabee will NOT run for President in 2012. Okay, to be perfectly honest PGH doesn’t have a stable of expert pundits (or even ponies) and this is more of a guess than anything we actually “learned,” but since we’ve been thinking Huckabee wasn’t going to run for months and he plans to make “an important announcement” on his show on Saturday, we figured it was a good idea to say it before he did and get accolades for being a perfect prognosticator. And if we’re wrong we’re no different than thousands of other self-professed pundits who guess wrong most of the time so no harm no foul. 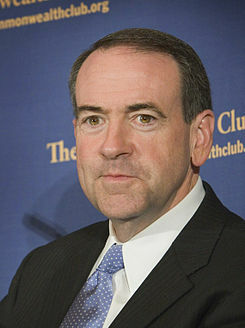 So PGH guarantees that tomorrow, Saturday, May 14th, 2011, Mike Huckabee will announce that he knows he has no shot at winning the election and really really likes making all the money he is making as a media icon. Okay, maybe he will phrase it differently but that’s pretty much what he’ll mean. Come back on Sunday to see if I’m patting myself on the back or trying to figure out how to cook crow so that it tastes better when I eat it. I’m pretty sure I’m on safe ground here though.